You can have 9 email accounts all at once, but there's still something so wonderfully refreshing about getting an envelope addressed to you in the mail. On the other hand, email is just so damn convenient. That's where our app comes in. 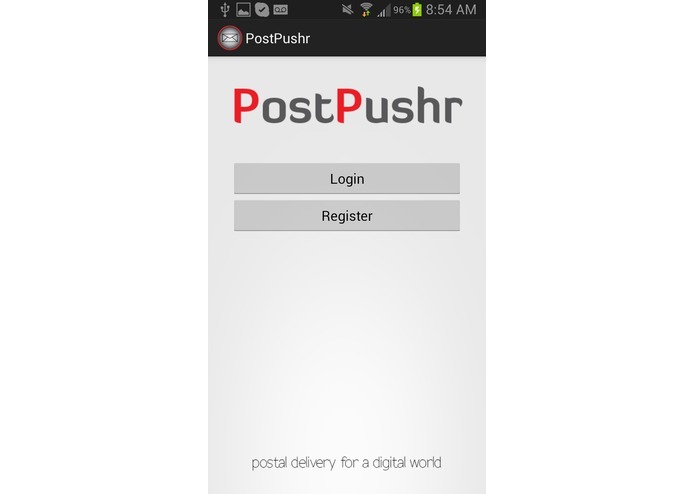 PostPushr combines postal delivery and cloud printing in one simplified service for general personal use. Bid farewell to fumbling through cluttered drawers for stamps and making errant stops at the post office. 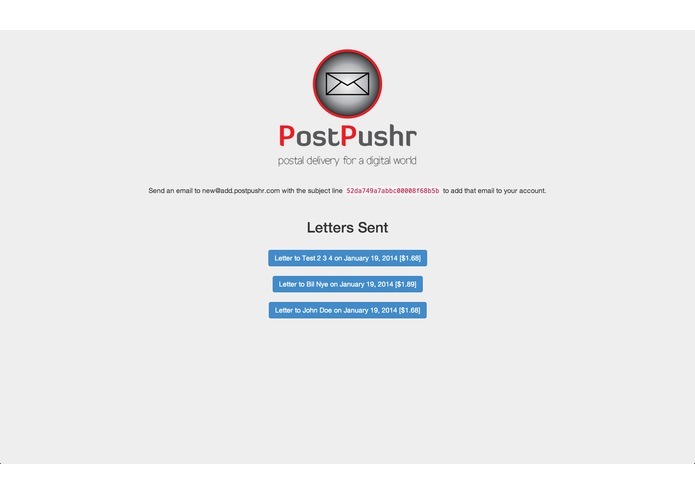 With PostPushr, all you have to do is open up your email, type your message in the body, and hit send. BOOM! With the power of Lob, Sendgrid, Stripe, Google Maps, MongoDB, and NameCheap, your email will end up as a letter in your recipient's mailbox! Imagine: you're here at MHacks and left your spouse/partner/significant other back at home. How romantic it would be to send them a love letter, from amidst the chaos of sleep deprivation and junk food galore, without having to brave the cold and walk to a post office! But if that prospect left you swooning, check out the second part of our project. 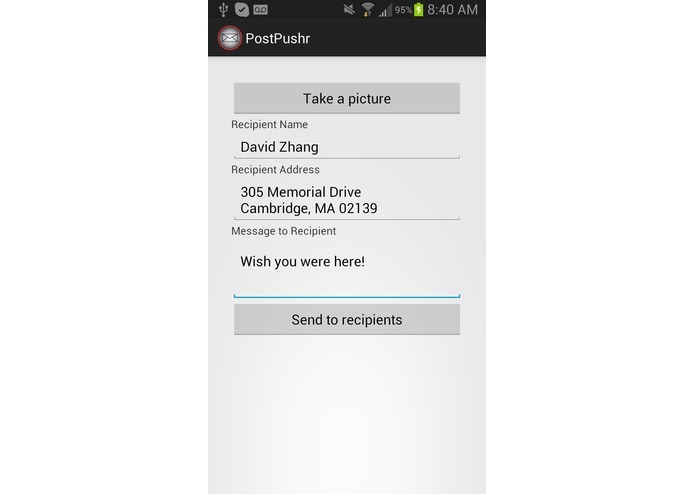 With our mobile app, just take a picture and your selfie can be immediately sent...as a postcard! Our mobile app will generate a digital postcard with the picture, then print it out and mail it--like a physical, tangible Snapchat. Now people don't even have to feel bad about screenshotting your beautiful face, they can just frame the postcard they get. Your loved one can see you "Wish they were here!" as you drown in your StackOverflow and snack overflows. 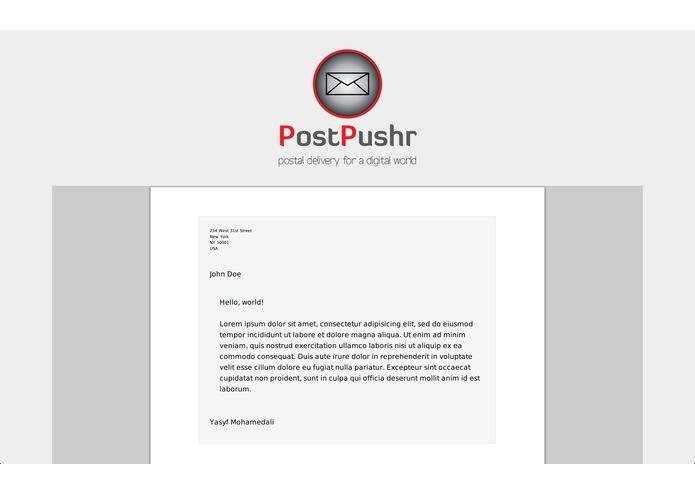 Opening up a new message, enter the name of your recipient in front of @letter.postpushr.com, with underscores substituted for spaces. For example, if I wanted to send a letter to David, I would email David@letter.postpushr.com. 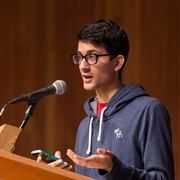 If I wanted to mail Aneesh Agrawal, I would email Aneesh_Agrawal@letter.postpushr.com. Enter the text of your letter in the email body. Hit send, and wait for your lucky recipient to get a delightful surprise in the mail!